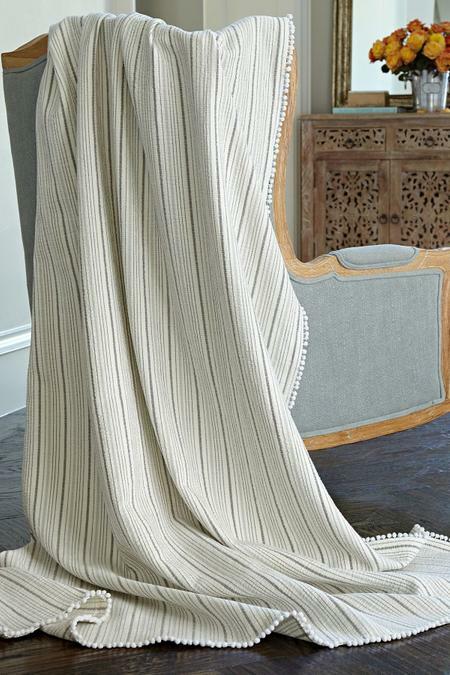 Beachy as can be (yet so sophisticated), this summery oversized coverlet takes its inspiration from classic seersucker stripes. Cast in soft shades of grey and white, it's a lovely layering piece for an all-white bed or to tone down bright colors. Woven of textural, lightweight cotton, tiny pompoms add whimsical trim to three sides. Pebble. Tiny pom pom trim on three sides. Beautiful mixed and layered with our other bedding collections. Machine Wash Cold, Only Non-chlorine Bleach When Needed, Tumble Dry Low,cool Iron If Needed, May Be Dry Cleaned.